The Gulf of Mexico is hugely important to birds that migrate between North America and the Neotropics—almost all migrants have to go around it or across it. Coastal habitats around the Gulf of Mexico are critical for these migrating birds, but these habitats face more and more threats from human activity. A new Review in The Condor: Ornithological Applications brings together what we know—and don't know—about the state of the region's ecosystems and the birds that pass through them. Understanding the population impacts of events during migration requires knowing which species are using what coastal habitats, how good those habitats are, where the birds are coming from, and where they're going. Birds use a variety of coastal habitats, from vast tracts of hardwood forests to patches of vegetation embedded in agricultural or urban areas. The amount of food present in these areas, the intensity of competition for that food, and the danger from predators all shape how well a certain spot can meet a migrating bird's needs. 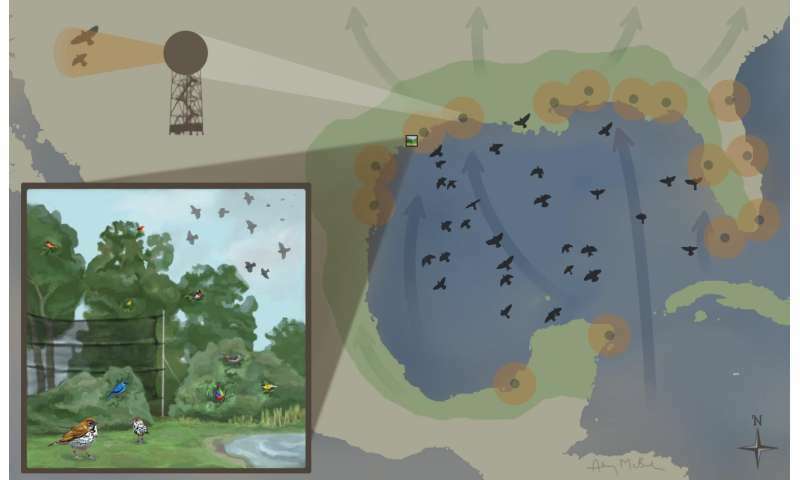 Threats to birds passing through the Gulf of Mexico include coastal habitat loss from forest clearing, wetland filling and dredging, and shoreline hardening; tall structures like cell phone towers and wind turbines; and, of course, climate change. More data is needed in all of these subjects. Today the Gulf of Mexico Avian Monitoring Network is taking on the enormous task of coordinating monitoring across the region by integrating the efforts of multiple organizations and agencies. Doing this well will require close cooperation between the United States, Mexico, and Caribbean countries. "Many migratory bird species are declining, including the species that breed in our backyards every summer, and we're trying to understand if events that occur during migration might impact birds here on the breeding grounds. Our focus is the Gulf of Mexico region because it's a bottleneck for migratory land birds—a place they have to move through every spring and fall," says the Smithsonian Conservation Biology Institute's Emily Cohen, the lead author of the Review. "Birds use these coastal habitats twice a year to eat and rest before and after their spectacular non-stop flight across the Gulf, which can take up to twenty hours! What's going on during these migratory journeys is the final frontier for bird biology, and many new tools are making it possible to solve the mysteries of migration that previously limited our ability to develop conservation priorities." "This Review highlights the tremendous importance of the Gulf of Mexico to migratory birds, not only from an ecological and conservation perspective, but also as an opportunity to understand mechanisms that drive the evolution of migration across dozens of families," according to Erik Johnson of Audubon Louisiana, an expert on bird conservation in the region. "As this paper makes clear, preserving this landscape is a tremendous responsibility shared across multiple countries, and our collective success has implications for how our descendants across North America will experience the amazing phenomenon of bird migration."